Where to Buy 4 The Birds Liquid, 4 The Birds Transparent Bird Repellent - Gallon - $46.95 for Sale with Fast Free Shipping! 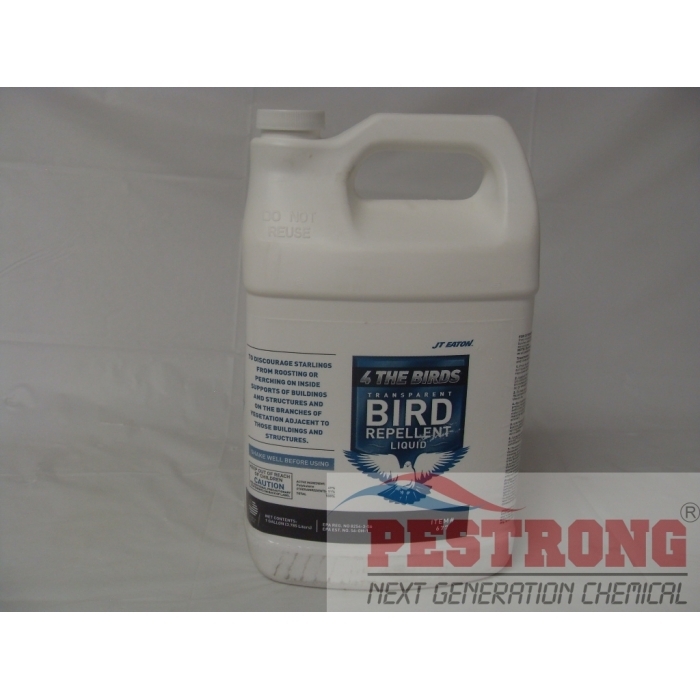 4 The Birds Transparent Bird Repellent - Gallon is a sticky liquid repellent used to deter pigeons and starlings from landing on interior surfaces and outside vegetation. Although opaque white when applied, it sets up as a colorless film. It can be sprayed or painted on to various surfaces providing broad coverage. Interior Use-beams, trusses, pipes, etc. Make sure to protect areas below or around the application surface from over spray or run off. Apply full strength - do not dilute. Thoroughly shake or mix repellent before application. Spray to the point of run off. Make sure all top surfaces are completely coated. This will necessitate the operator being level with or above the surface being sprayed. To spray, use a hand pump or mechanical sprayer with a discharge pressure between 40 to 150 p.s.i. Apply repellent with a paint brush to surfaces that are difficult to spray without excessive over spray. Make sure to protect areas below or around the application surface from over spray or run off. Apply to the point of run off on top of any branch large enough to support a pigeon or starling. Apply full strength - do not dilute. Thoroughly shake or mix repellent before application. Use spray equipment capable of discharge pressures of up to 150 p.s.i. Arial spraying is NOT PERMITTED. It is recommended to treat trees, bushes and shrubs in the fall or early spring when limbs are bare and easily accessible. NOT FOR USE ON OUTDOOR BUILDING SURFACES OR ARCHITECTURE. Apply in temperatures of 40o or more. Drift can be reduced by applying in calm conditions. Generally 1 gallon could do 1 tree with 5" diameter trunk (after foliage has fallen), or about 6-3 ft high bushes. These coverages are approximate. Clean-Up :Use mineral spirits to clean equipment immediately after use. Use mineral spirits to clean interior surfaces. Remove repellent from sealed concrete and stone with a water hose immediately after exposure. It works. I found no bird near gel area. Thanks.